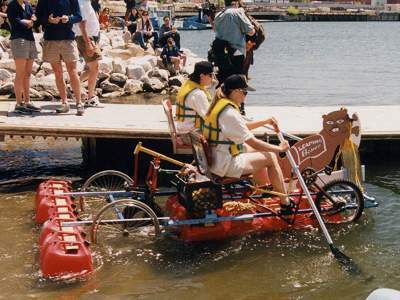 A bright sunny day in Baltimore heralded the third annual Kinetic Sculpture Race. It was so warm, in fact, that at least one kinetinaut had to forsake his thick foam costume. The solar energy only added to the fun. 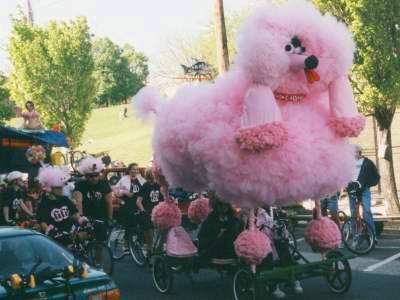 The most prominent sculpture by far was Fifi, the 13-foot tall pink poodle. Hersh and I followed the race through the city on the Water Taxi, and each time someone else on the boat would notice Fifi winding her way through the streets on shore. "What on earth is that pink thing?" 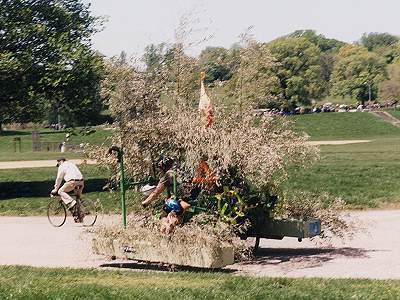 This sculpture was cleverly disguised as a bush, and rustled considerably in the wind. If you look closely, you can see the orange safety triangle and one of the the yellow waterwheels. On the water, they drifted far off course and had to be towed back toward land. 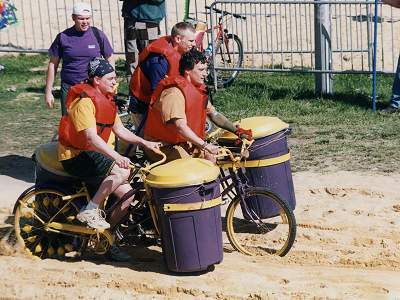 Trash cans are an interesting floatation device, with cups on the bike spokes for water propulsion. This island hospital sculpture included a cheap plastic tiki and medical-costumed characters. This spartan design came from Towson University. It worked acceptably on land and water, but had a forgettable design. 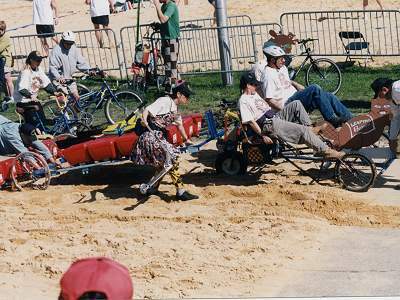 This 3-wheel recumbent design was extremely efficient on land. The gray bars were entirely decorative, and seemed to be design fluff until another spectator explained that last year, the same pilot rode the same sculpture wearing a shark suit. He installed special mud tracks, but when he entered the mud they immediately seized up. After removing them, he rode through elegantly. The sand trap posed a challenge to many sculptures, but not these guys. They built up momentum and churned through. In contrast, the two pilots on this sculpture needed pushing and pulling from three pit crew members to get through the sand. Some sculptures bypassed the sand altogether. 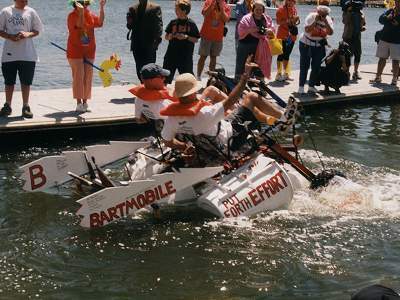 Cheating, yes, but there's no way this low ground-clearance craft would have made it across. 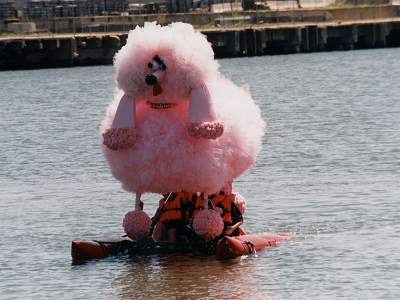 On the water, Fifi floated well, and went reasonably quickly in the water when the four pilots worked at it. Unfortunately, the pilots didn't seem to have any ability to steer, so she drifted so far off the course she had to be towed back. These people may look like they're sinking, but their craft was decidedly seaworthy (although it was probably fortunate for them that the water racecourse never left the pier). This bug-design sculpture was a disaster in the water. They had a gray-painted styrofoam pontoon on each side, but seem to have discovered that provided inadequate flotation. So there were also two yellow-painted PVC pipes tied with twine to each side. Very loosely tied. 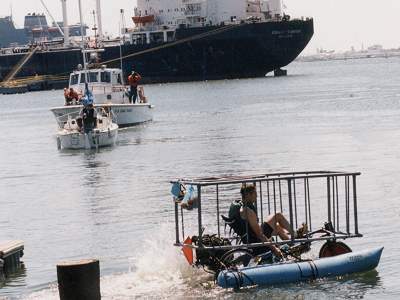 As they rode down the ramp approaching the water, the yellow pipes slid forward several feet. Once in the water, their center of mass was behind most of their floatation, and their craft immediately tipped backward. It looked like they hadn't tested the finished sculpture in the water. 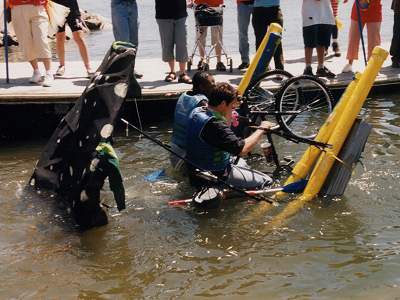 Fortunately, capsizing didn't destroy their entry, and they continued the race on land. The guys who needed so much help in the sand switched to oars on the water. In the water, the shark sculpture was the hands-down winner. When another sculpture went off course and began drifting in the harbor, the pilot of this craft literally rode circles around it. Meanwhile, the Coast Guard keeps watch for errant sculptures. Up on the hill came the mud race. There was a 40-foot section of mud carefully constructed by race volunteers. 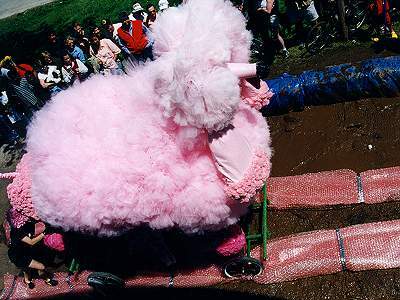 The sculptures went through one by one, and Fifi attracted quite a bit of booing as she rode across on bubble wrap that kept the mud from her sensitive self. The mud posed challenges to other sculptures as well. 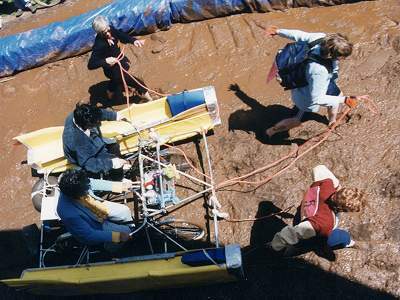 These twin Elvis impersonators in their tailfin-bedecked sculpture slogged through the mud only with the help of a tow from several pit crew members. 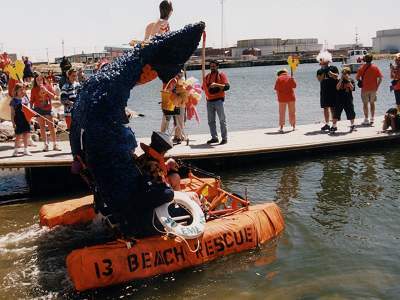 Right after the mudrace came the inflatable rescue, the only part of the Kinetic Sculpture Race that had nothing to do with Kinetic Sculptures. 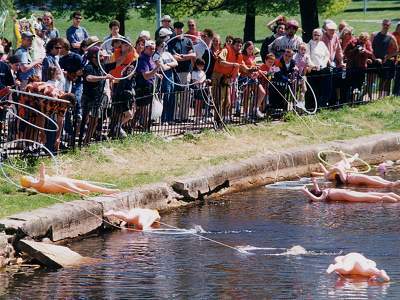 Each team was given a hula hoop tied to a length of twine, and was challenged with "rescuing" as many inflatable women and men as they could. This guy followed along with the race, shouting through his construction-cone megaphone and slowed dramatically by the drag chute consisting of a huge number of inflated grocery bags mounted on a frame. The racecourse is patrolled by a large number of volunteers, each equipped with a chicken-on-a-stick. These sculpture cops demanded bribes from passing sculptures. 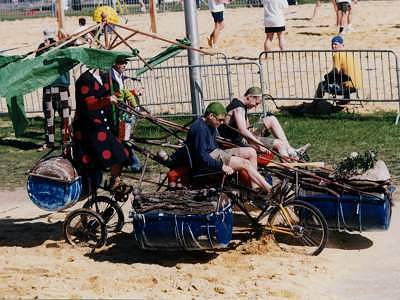 You can hear more about what happened at the race from NPR's Weekend All Things Considered (scroll down to "Kinetic Sculpture Race").